If you are looking for a way to turn that inefficient wood burning fireplace into a high efficiency and clean burning heating source, we can do it! A direct vent gas insert uses the same technology found in today's direct vent gas fireplaces. An air tight fire box pulls outside air for combustion down the chimney through a 3 in. aluminum liner. Another 3 in. or 4 in. aluminum liner delivers by-products of combustion (exhaust) up the chimney. The sealed system also protects you from the down drafts that are usually associated with a conventional venting system. The compact design and flexible venting system allows for installations into many types of fireplaces, from masonry to zero clearance, small or large openings. 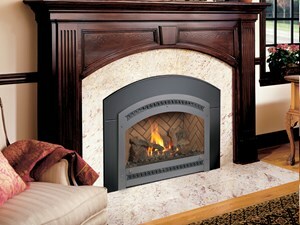 The 34 DVL™ GSR2 is our deluxe gas insert model designed for medium to large fireplaces. It comes fully loaded with GreenSmart 2 features that include Accent Lights*, convection fan and the GreenSmart 2 Wall Mounted Thermostat remote. It will turn your inefficient fireplace into a convenient source of gas heat for your home. This insert is ideal for either masonry or zero clearance (metal) fireplaces and is perfect for zone heating mid-sized to large living spaces, heating up to 2,000 square feet. 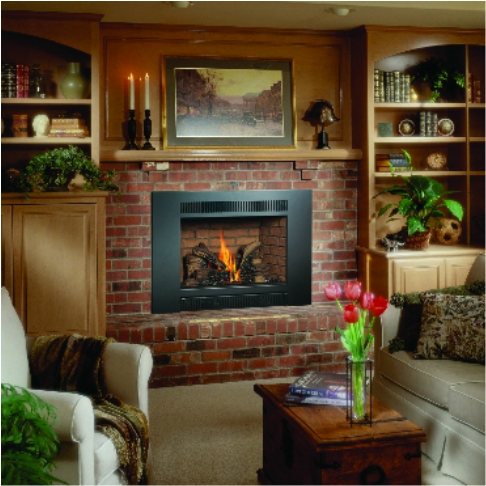 The 34 DVL GSR2 insert features the choice of the Dancing-Fyre™ burner with three log or stone options, or the award-winning Ember-Fyre™ split-flow burner, which produces a realistic “wood like” flame along with the heat output that can be controlled by the convenient GreenSmart™ 2 gas system with Comfort Control™. This allows you to turn off part of the burner with the push of a button to really turn down the heat while maintaining a fire and glowing embers. The 33 DVI™ GSB is our manual gas insert model designed for medium to large fireplaces. This insert comes with basic GreenSmart™ features that include ON/OFF thermostat control, standard convection fan, and the optional basic remote or wall thermostat. The 33 DVI represents a new direction in gas heating that offers you a top-quality gas fireplace insert at an affordable price. The 33 DVI is all about the basics: a big, beautiful, brightly glowing fire and a simplified operating system, yet offering the same glass viewing area as the top-selling DVL™ GSR2 gas insert. The 33 DVI features the Dancing-Fyre™ split-flow burner and IPI electronic ignition that allows you a great fire display and a green” money-saving solution to home heating. The 33 DVI GSR2 designed to heat up to 2,000 square feet and is suited for medium to large homes or for zone heating a larger living space. Lopi has a variety of gas inserts to choose from. Click on the attached link to see the complete line up that will be sure to fit any home. Reliable Performance and Great Features at a Reasonable Price! Look no further than the Lopi Radiant Plus Inserts. The Lopi Radiant Plus Gas Fireplace Insert with standing pilot is the perfect choice for anyone seeking reliable performance and great features at a reasonable price. Fireplace inserts with standing pilots start up easily and require no power to run or operate, making Radiant Plus a reliable heat source for any home -- even during power outages! This fireplace insert offers more standard features than any other comparable gas insert and is designed to deliver year-round comfort that can be tailored to your specific heating needs and provide warmth to living spaces ranging from 500 square feet to 1,650 square feet. The unique design of the Radiant Plus delivers optimum radiant and natural convection heat while showcasing a massive fire viewing area that’s the largest in its class! you may consider the smaller version.